Saturday’s convergence of Ute home events: Red-White Game and Utah Beach Classic. 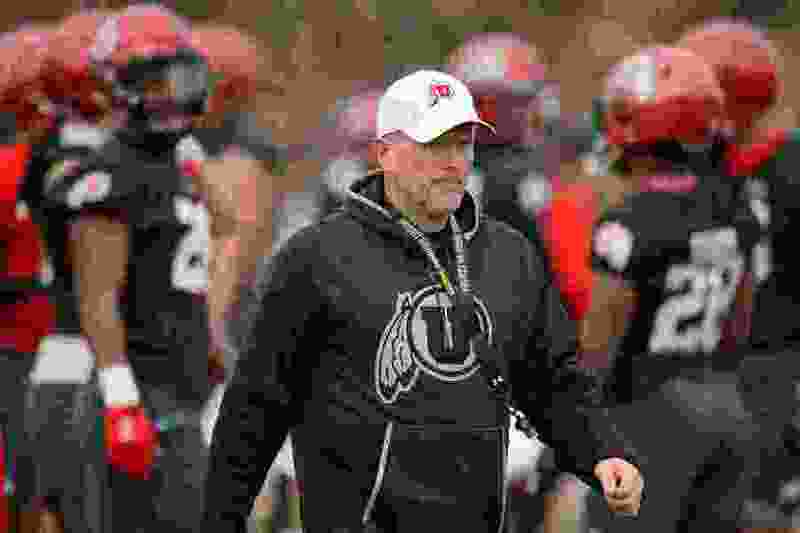 (Trent Nelson | The Salt Lake Tribune) University of Utah coach Kyle Whittingham at the first day of spring football practice in Salt Lake City on Monday March 4, 2019. There’s no better source for Utah Jazz news than The Salt Lake Tribune and we don’t want our readers to miss anything during this playoff run. That’s why we are dropping the cost of an annual digital subscription to just $1 per week or $52 for the year. This flash sale ends Sunday night. Go to www.sltrib.com/subscribe and click on digital unlimited. Utah football coach Kyle Whittingham was topped by his friend, Washington State’s Mike Leach, in the voting for the 2018 Pac-12 Coach of the Year. Whittingham’s performance in leading the Utes to their first Pac-12 South title has not gone unrecognized, though — beyond the new contract he received in March, taking him through the 2023 season. Whittingham this week received the Coach of the Year (Male) trophy in the annual Governor’s State of Sport Awards. Utah’s coaching staff persevered through an 0-2 start of conference play and injuries to quarterback Tyler Huntley and running back Zack Moss to finish 6-3 in the Pac-12 and win the outright South championship. The Utes won their last three games of November, overcoming the program’s perceived hex in that month. One of Utah’s most memorable October plays — receiver Britain Covey’s 58-yard touchdown pass to Huntley vs. Arizona — was featured as one of three Highlights of the Year. As we now know, Covey threw that pass with a broken bone in his wrist. Huntley has looked good this spring, in his return from injury, while Moss and Covey have been rehabilitating. The offensive line showed improvement in last Friday’s scrimmage, considered the biggest event of spring practice (TRIB). About one-third of the starters will participate in Saturday’s Red-White Game (11 a.m.) at Rice-Eccles Stadium. The offensive linemen will get a fair amount of work, playing for both teams. Javelin Guidry plays as Utah’s fifth defensive back, thriving in an important position in the scheme. He’s fast, but that’s not all he has going for him (TRIB). The Ute women’s gymnastics team again has qualified for the NCAA meet. That achievement is more meaningful this year, in the new format that sends only eight teams to the Fort Worth, Texas. As always, Lya Wodraska has thorough reports on the Utes’ regional performance (TRIB) and what’s ahead next week (TRIB). After an adventurous season for the Ute women’s basketball program, a nice moment came Wednesday night when forward Megan Huff was drafted into the WNBA. She was the No. 26 overall pick of the New York Liberty, and she appreciates the opportunity (TRIB). And credit to those who accurately predicted Huff’s being taken in the third round, as covered in this draft preview (TRIB). The school staged a draft party for Huff and a season-ending banquet for the program and its fans. Both events served as a farewell to Willette White, Utah's director of basketball administration and operations, who's retiring after 36 years in women's basketball. She was part of the Ute staff for eight seasons. Kendall Rodriguez, who played for Ute coach Lynne Roberts at Pacific, was promoted from another support staff position as White's successor. The biggest news of the week for the Ute men’s basketball was alarming. Starting center Jayce Johnson has entered the NCAA transfer portal with one year of eligibility left (TRIB). The Las Vegas Review-Journal reported that Ute assistant coach DeMarlo Slocum is being targeted for a position on UNLV’s new staff. Johnson could end up staying, as teammates are encouraging him to do, but Slocum appears to be gone, according to national college basketball reporter Jon Rothstein. Either departure would be a significant loss. The Ute lacrosse team has done a lot of good things in its Division I debut, but the Utes won’t have a winning record. That became mathematically clear after a 16-15 loss to Mount St. Mary’s in a tense, entertaining game last weekend at Judge Memorial (TRIB). Brayden Ramsay of the Daily Utah Chronicle explored the Ute football program’s family theme (CHRON). The Utes’ Pac-12 basketball rivals are filling their coaching vacancies, and conference expert Jon Wilner endorsed UCLA’s hiring of Mick Cronin (MERC). Trent Wood of the Deseret News addressed the importance to the football program of having defensive linemen Bradlee Anae and Leki Fotu return as seniors (DNEWS). • Jordan Lindley, a member of Utah’s athletic media relations staff, works primarily with football, women’s basketball and tennis. As she pointed out, those programs have a common achievement in 2018-19: a win over a Stanford team ranked in the top 15. The Utah men’s tennis team defeated the then-No. 12 Cardinal 4-2 on Senior Day last Sunday. The Utes will play this weekend at Arizona and Arizona State, then prepare for the Pac-12 tournament. • Utah’s baseball team (8-18, 1-11 Pac-12) has lost 11 straight conference games, a streak that includes extra-innings losses at highly ranked Stanford and Oregon State. The Utes will stage a three-game series vs. USC at Smith’s Ballpark this week, amid the Salt Lake Bees’ opening homestand. The Utes and Trojans will meet at 6 p.m. Thursday and at 11:30 a.m. Friday and Saturday. • Utah’s softball team had a rough series against national power Arizona last weekend, giving up a total of 48 runs in three games and never reaching the seventh inning, due to a run-rule provision. The Utes (13-24, 2-7 Pac-12) will open a three-game series Friday at No. 25 Stanford. • Utah Beach is open Saturday. The Utes are hosting a beach volleyball tournament for the first time in the program’s three-year history. The venue is west of the McCarthey Family Track and Field on the east side of the campus. The Utes will meet Colorado Mesa at 10 a.m. Saturday and play Boise State at 4 p.m. In between, the visiting teams will play at 1 p.m. The Utes (4-6) will compete in the Pac-12 tournament, beginning April 25.